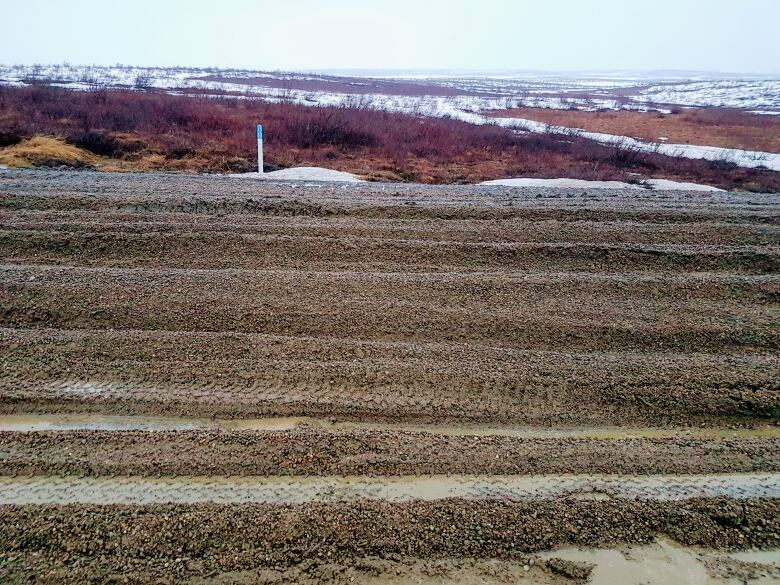 The Inuvik-Tuktoyaktuk Highway has closed for what seems like a longer than usual period due to rainy and muddy conditions. 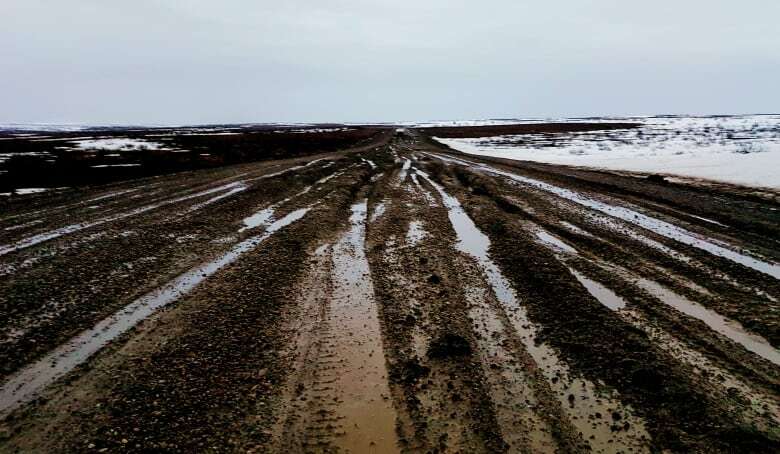 Travellers had to ditch their vehicles in order to make it to and from Tuktoyaktuk, N.W.T. The Inuvik-Tuktoyaktuk Highway has closed again, but this time it seems like it's for longer than normal. Michael Wieleba and his fiancée Aman Haj-Touama drove the highway in the early morning hours on Saturday before the highway closed due to the rainy and muddy conditions. 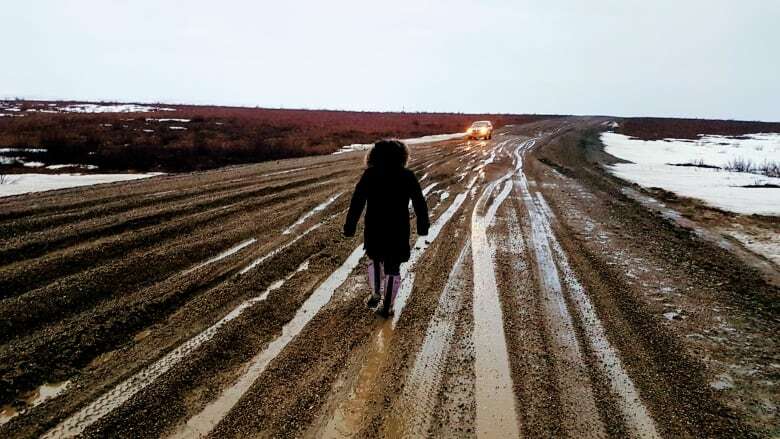 Haj-Touama is a teacher at Mangilaluk School in Tuktoyaktuk, N.W.T., and was trying to get back to the hamlet after going away for spring break. "It looked like a whole different highway. It didn't even look like the highway that it originally was," said Wieleba. "We basically would drive through a whole bunch of mud, and then get to a solid spot. And because I had to basically push my truck through this mud, the engine kept overheating." Wieleba said they thought about turning around a few times. "We knew if we got stuck, it would be game over," he said. After nearly five hours, they arrived in Tuktoyaktuk, just before a friend was going to alert authorities to send help. Meanwhile in Inuvik, teachers were still coming back from vacation when they started to realize they might miss school on Monday. Emily Beresford, a senior kindergarten teacher, said she and six other teachers were originally going to carpool together on Sunday, but the highway was still closed. "A group got together and we decided to charter a flight," said Beresford. But Beresford said that since everyone was trying to make it into work "it was very stressful and a huge inconvenience." She said between being forced to spend a night in Inuvik and the flight, she ended up paying "double the cost of the medical bus, which is what I budgeted for and quadrupled the cost of a ride-share." "It's an ice road on land and that pretty much sums it up." The highway has been having half-day closures from noon to midnight for the last two weeks, but it's now been closed for four days straight. The territorial Department of Infrastructure has yet to confirm when the highway will reopen. Binay Yadav, director of transportation with the department has said that drivers can expect closures to happen during the spring for the next few years. Aklak Air made an announcement on social media that they have begun offering flights to Tuktoyaktuk from Inuvik again starting Monday evening. This is after the airline cancelled this service in February. When CBC called the reservation line, an Aklak Air representative said they are currently offering flights twice daily until Friday. Wieleba, who lives in Inuvik, said he took a flight Tuesday morning after giving up hope that he could drive his truck back to town. "I'm nervous because I don't know if the road is going to go and open before the season is over," said Wieleba, who usually drives to the hamlet once a week. "I keep hearing rumours that the highway is going to close until September, October, maybe November. So it's kind of nerve-racking right now." ​He said the Department of Infrastructure should be giving a 24-hour road closure notice on the Inuvik-Tuktoyaktuk Highway that is similar to ice road closures if possible. "That way people can start making their final moves, whether they want their truck in Inuvik or not," said Wieleba. "It's unpredictable and it's just not reliable, and it's unfortunate."